Captain America: The Winter Soldier film will soon appear in our cinemas, and so it’s not surprising at all that the creators of this superhero blockbuster have decided to remind us about it, having presented a small promotional video. The new Captain America: The Winter Soldier trailer briefly shows us the major events of the upcoming movie. Here you will see the film’s protagonist - Captain America, - his newly assembled team-mates - Black Widow, Falcon, Winter Soldier, - as well as some mysterious new enemy of The Avengers. Besides them, a lot of explosions, shooting, the fantastic chases and fights - all as it should be in a good blockbuster - await you in the upcoming movie. We can describe the content of the fresh video for long time, but it is better to watch new Captain America: The Winter Soldier trailer, which appeared a few hours ago, with you own eyes. But that’s not all movie’s videos that were released during last days. 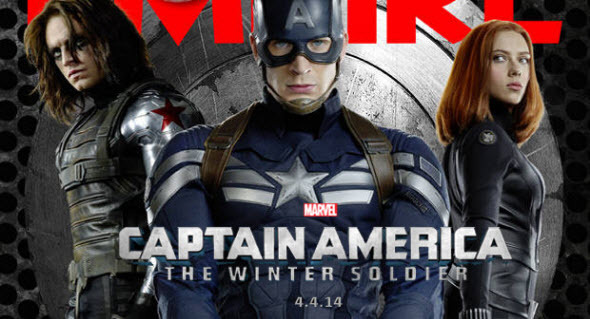 Yesterday two new short Captain America: The Winter Soldier trailers were published. Watch and enjoy! We would also like to remind you that Captain America: The Winter Soldier film will appear on the 4th of April in the USA cinemas. Among the actors who have taken part in the shooting of this blockbuster you will see such stars as Chris Evans, Scarlett Johansson, Samuel L. Jackson, Dominic Cooper and many others. And are you waiting for the release of this superhero movie? Are you going to watch it in the cinema? Your answers can be left at the bottom of the page.